Former Republican Speaker of the House John Boehner on Wednesday was the keynote speaker for the KPMG Global Energy Conference, where he candidly took questions from the audience for an hour straight on various topics, including President Donald Trump. Boehner said he and Trump have been friends for 15 years and that they golfed together. The former Ohio lawmaker added that if he was having a bad day on Capitol Hill, Trump would be the first person to call and check up on him. However, Boehner said he could have never envisioned Trump becoming president, RigZone reported. "But president? I just never envisioned him in that role," Boehner said, adding that Trump should not be allowed to tweet overnight. Boehner said that Trump has done well with international affairs and that global leaders are happy he is aggressive about combatting the Islamic State and using military force to do so. On health care, Boehner said that Trump "did what he could," but added that the president should have worked to "repair" Obamacare rather than repeal and replace it. 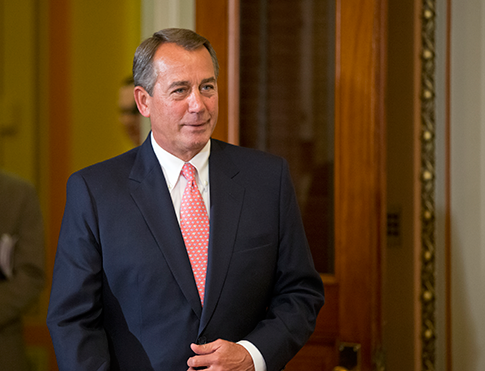 "Everything else he's done [in office] has been a complete disaster," Boehner said. "He's still learning how to be president." Boehner was also asked about tax reform and whether Trump will be able to pass it. "I was a little more optimistic about it early in the year; now my odds are 60/40 … the border adjustment tax is deader than a doornail … tax reform is just a bunch of happy talk," Boehner said. Someone in the audience brought up the investigation into ties between the Trump campaign and Russia and whether Trump could be impeached. "I don't know why either of these campaigns [Hillary Clinton or Trump] were talking to Russians, but they need to get to the bottom of this … the crazy left-wing Democratic colleagues of mine bringing up impeachment talks … talk of impeachment is the best way to rile up Trump supporters," Boehner said. "Remember, impeachment is not a legal process; it's a political process." Boehner was also asked about his future ambitions and whether he would run for president one day. "I don't want to be president. I drink red wine. I smoke cigarettes. I golf. I cut my own grass. I iron my own clothes. And I'm not willing to give all that up to be president," he said. Boehner resigned from Congress in October 2015 and has no regrets about his decision to leave Capitol Hill. "I wake up every day, drink my morning coffee, and say hallelujah, hallelujah, hallelujah," Boehner said. This entry was posted in Politics and tagged Congress, Donald Trump, Health Care, Hillary Clinton, John Boehner, Russia. Bookmark the permalink.